We try to eat homemade pancakes or waffles for dinner once per week because it’s easy and super frugal. I’ve been enjoying homemade apple preserves on top of them since the Fall, but this last week we ran out. 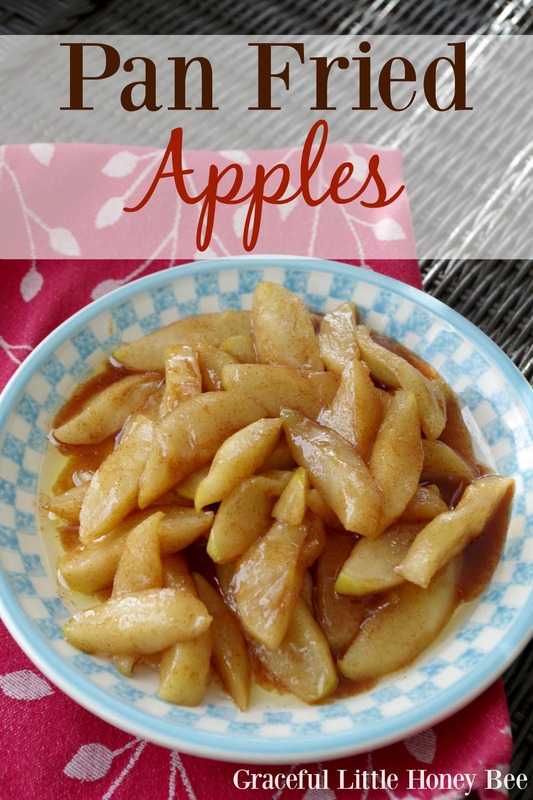 So I decided to make these easy Pan Fried Apples instead. They come together quick and only call for 4 ingredients. Plus, they’re better than any restaurant variety. I hope you enjoy! Step 1: Peel, core and slice apples to 1/4 or 1/2 inch thickness. Step 2: Melt butter over medium heat. Step 3: Add apples to butter and cover (stirring occasionally) for approx. 6-8 minutes. Step 4: Once apples are soft, stir in sugar and cinnamon. Step 5: Cook additional 2-4 minutes. Serve Immediately. Peel, core and slice apples to 1/4 or 1/2 inch thickness. Add apples to butter and cover (stirring occasionally) for approx. 6-8 minutes. Once apples are soft, stir in sugar and cinnamon. Cook additional 2-4 minutes. Serve Immediately. My mom made pan fried apples all the time. This brings back so many fond memories. I think I can even smell them!